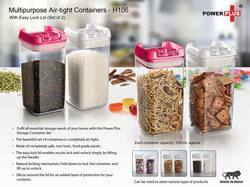 - Convenient food-storage container for kitchen, 100% Airtight and watertight which is high-quality plastic. These containers are made of pure food grade plastics use for masala, pickle and use for multipurpose. MultiPurpose Containers. Used in Food Industry, Non-Food Industry.